What are the repeated critiques you hear about modern worship? It looks too much like a concert. The songs are so repetitive. It’s too much about ‘me’. I am sure there are more, but let’s just take these five. I will focus on the first three in this post, and on the last two in the next installment. First, the critique of noise and the use of non-sensical, monosyllabic words. And what sort of musical accompaniment ‘enhances that fervor’? Why, a rhythmic noisiness, of course. The parallels with ancient Israelite worship are not insignificant or incidental. I grew up in non-denominational, Pentecostal/Charismatic churches, and almost every teaching on worship I heard was rooted in the Old Testament: patterns of the Tabernacle of David and the Temple of Solomon, the stories about the Ark of the Covenant, the Hebrew words for praise, the Psalms, and on and on. This is not to say that there was no reflection given to what makes worship Christian. We understood how the three symbols/figures central to Israelite worship– temple, priest, and sacrifice– are fulfilled in Christ. And what’s more, we understood (if only dimly) that what is true of Christ is true of us: because He is the temple, the priest, and the sacrifice, we have become the temple, priests, and living sacrifices. The influence of Old Testament worship texts was not set in isolation from or in opposition to the New Testament or a Christological understanding of worship. While Goldingay notes that in some Calvinist traditions, music that overpowers the voice is problematic (as it was for Barth), for those steeped in ancient Israelite worship, the louder the better! Next, the critique about the resemblance to a rock concert. For those loosely familiar with my work over the past few years, you know that I have challenged the church— at times quite sharply— to work more attentively to align the visual elements of a service (lights, stage, layout…even architecture, where possible) with the verbal elements. 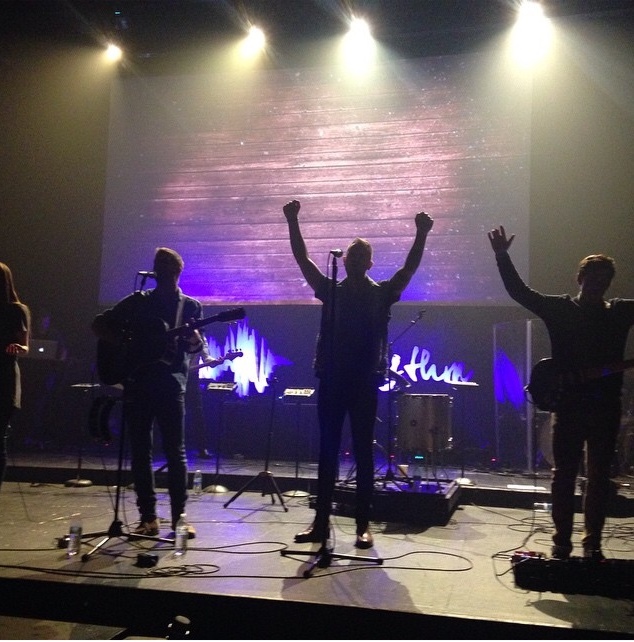 Too often we say it’s all about Jesus while the image magnification continues to put our worship teams in focus. So, this critique has considerable merit. And yet, we are too careless in applying it. See a church with lights? Ah, it must be a rock show. See a band front and center? They must be ego-maniacs. Yet it is not simply the presence of a cultural form in Christian worship that matters; it is how Christians inhabit that form. There is a parallel here in Biblical studies. When a young bible student discovers that there were Babylonian stories of a ‘Job’-like character, he may be initially dismayed. Oh no. The Bible is not true after all. It is simply borrowing well known ancient myths and reworking them. But such a conclusion would be a mistake. For it is not simply the presence of the myth that matters; it is how the Israelite storytellers ‘inhabited’ that myth— how they made it their own and re-worked it. And the differences make all the difference. With Job, it matters greatly that YHWH speaks to Job, whereas the Babylonian god, Marduk, does not. YHWH is not simply transactional, giving back what was lost; YHWH is fiercely personal. And so in worship services, we must not be lazy and look only for similarities between a church service and a rock concert. We must also pay attention to the differences. Here’s an example. At a recent conference our church hosted, our worship team came out to lead after a well-produced, creative and inspiring video opener. Now, the genre of conference opening sessions says, “Open big! Capitalize on the excitement! Build the momentum!” To be sure, there is nothing evil about doing that. Yet, Jon Egan—my friend and the worship pastor at New Life Church— chose to subvert the script. They came on stage unspectacularly. Jon was hidden behind the other leaders playing a floor tom drum for the first song, a mid-tempo number with no added hype. Think more deeply: What are the other elements of the ‘rock concert’ cultural form? A front man or woman, lights (focused on the lead singer), perhaps music that capitalizes on the emotion. But you know what our team did? There were six people across the front, and the darn thing about even numbers is no one becomes the center. When Jon— surely the one in everyone’s mind who should be the leader— finally did speak, we were four songs in and in a worshipful frame of mind. And during the song that he did lead, the lights all of sudden went dim, silhouetting the band, drawing our focus further upward on God. Now, this is simply one example. You can think of others. And it does not solve all our problems with borrowing the rock concert form. But that’s the point: there is no easy way through this— no easy critiques and no easy defenses. We must constantly wrestle when we borrow cultural forms; we must work intentionally and attentively to let all the elements— sight and sound and action— center on Christ and proclaim the Gospel. But such carefully work won’t be the result of cheap critiques of modern worship. There is one (valid, in my opinion) critique that was left off of your list. Most modern worship music, especially written in the last 4 or 5 years, is too high for the average person in the congregation. I have a standard range, not too high and not too low, and used to be able to lead worship but most songs are written well outside of it now. The average range is the A below middle C to a D an octave above (drop it an octave for men). Songs now get to the F, G and even A above that and stay there for most of the song. I would but I’m not in a leadership position to make that happen and most worship leaders I know don’t change keys. Even if they did, it’s difficult to change the key on some songs because they are written low and then jump octaves. If you do change the key, the high parts are now singable but the lower parts are too low. I’m a huge fan of Goldingay – please do read everything he writes! It may be worth thinking through *why* people think it’s too noisy rather than dismissing them. Rarely will so many Christians make the same point without there being some validity hidden somewhere in what they’re saying, even if we have to dig to get to the core of what is going on and restate it a different way. You mention that people are saying that it (the worship) is too loud and the counter-argument you’ve made is that in the OT the people of God were loud in worship – but that’s not the same thing. People don’t usually say that the congregation is singing too loud, but rather that the band is drowning out the congregation being able to hear each other. The primary difference between worshipping to a CD and worshipping together is that in the latter we hear each other, our voices bounce of each other in melodies, harmonies inspired by the voices around us, ad-libs in full flow, vocal licks from those who can, and spirit-filled prophetic words and tongues flowing from the mouths of hearts laid bare. All of which is lost when the electric guitar is pumped up to 11 or when the only voices we can hear are the ones with a microphone. I’ve been in worship sessions where I can’t even hear myself sing, never mind the person next to me and, knowing that I’m adding nothing by singing, I will usually just sit down and pray. For every person that loves the wall-of-sound coming from a band leading worship and thinks that this is the worship ideal I know many more who find that it disconnects them from God and their fellow worshipper and they leave not having met with the living God or with any sense of having done so with their community of faith. For me this isn’t about what flavour of worship I or you prefer, but a fundamental question about what gathered worship is, and what its purpose is – the emphasis being on the word “gathered”. My greatest critique is one you didn’t mention here but one you certainly bring up in your book…does the way we worship cater to a sense of equating heightened emotionalism to true worship? I would say that in most cases no. Even your example with Jon and the band – while I’m sure they were genuine – still strikes me as somewhat manipulative. Would people have been just as in to worship if the lights were up and the singers were behind a curtain? Are the instruments actually facilitating the worship or have they become our crutch? These are always what has worried me about modern worship. I often wish I could change how the modern band operates, but if I were to do that, the service would resemble a liturgy, which no one wants. So, I’ve resolved that I can’t change modern worship, but I can only look in my own heart and ask God to constantly keep my focus on him. Maybe that’s what we all always need to do in modern worship. I just think it’s harder in the band-audience setting. This is an important post, Glenn, and it draws us into what I consider to be an important conversation. I like how you reveal that the issues we critique are often more complex than we realise. I’m sure you would agree that in many of these critiques we’re not talking about an either/or scenario, but one of degrees. For example, while for some the question of noise relates more to the kind of noise (i.e. if it was an organ playing that loud it would be ok), for others it’s a question of how much of the service consists of noise and how much space is allowed for silence. While Old Testament worship did often encourage noise, it also often called God’s people to silence and awe. The challenge for those who facilitate worship is to make space for both noise and silence. While there is place for monosyllabic chant, there must also be space for well expressed, even poetic, theologically deep language. And the concert critique, for me, is less about lights and sound than it is about the extent to which the congregation are helped or hindered to participate. If the people cannot actively participate in the worship, it’s a concert – even if the style is quiet and traditional, or even “liturgical”. Thanks again for your thoughtful approach to this important part of the Church’s life. From missionary friends in Africa which may help illustrate the use of rhythmic instruments: Izingolweni was the scene. About 360 people attended. It was interesting, as they had no musical instruments in the church, but with Africans singing, you really do not need instruments. However, several ladies had their homemade accompaniments – one being hitting a long metal object against the metal part of a garden hoe. Two other ladies used long PVC pipes and with their voices made a booming noise – sort of a bass sound. For those of us with sensory sensitive children,modern church music makes most churches literally PAINFUL for them. We, as a family, chose a liturgical church so that our children would not be in pain every week. It is not an option to have a band or lights or all the other trappings that goes along with ‘seeker’ sensitive churches. Some interesting points here. Regarding the rock concert point, I tend to take the line that if it looks like a rock concert, sounds like a rock concert and smells (smoke machines) like a rock concert then it probably is a rock concert in some form. It what way is it glorifying God to have a band moodily lit up on stage? Even if they don’t think they’re the center of attention, the staging and lighting screams the opposite. It does not help the modern evangelical charismatic subculture where the more well known worship leaders are almost idolized like celebrities. I think the main charge against modern worship music is that there is an unbiblical emphasis on periods of sung worship. That is, it is often at least implied that the center of our worship services and the main way we meet with God is through sung worship (with a soft rock accompaniment, I cheekily add). However, in the New Testament, singing (though important) seems to take a back seat to teaching, the sacrament, prayer and exhortation. IMHO we would do well to emulate the pattern on the NT and bring the latter things to the forefront in charismatic evangelicalism (a tradition I consider myself firmly a part of, by the way). Very interesting stuff, Glenn, and I appreciate that you are bringing some nuance to this conversation. It’s definitely a complicated one, and I am personally deeply grateful for much of the worship that you, Jon Egan and others have provided for the local church in Colorado Springs over the past years. This has been a fraught issue for me for many years, and I’m still wrestling with the answers, but I’m going to try and outline some ideas that have been challenging me in regard to this topic. Regarding monosyllabic chant: I wonder if the issue is less about the “what” of the practice in modern music. Non-verbal chant has been part and parcel of sacred and non-sacred music in many cultures throughout human history. Much of eastern sacred music in various religious traditions is actually built on monosyllabic, monotone chant. The problem that keeps bugging me is more with the “why” and the “how”. The “why” of using “yeah yeahs” and “ohs” seems to be related to worship leaders taking their cues from arena rock bands, relying on popular music as a bellwether rather than as a circumstantial factor; the “why” seems to be because people like Bono or Chris Martin do call-and-response, first singing out a non-word and then holding the mic out to the audience to repeat it back to them; I can’t get away from the idea that the “why” is because it’s entertaining. Consequently, as regards the “how”, it would follow that such a device would be meant to be entertaining in the same way that Mumford and Sons or Arcade Fire is exciting. The “how” invokes popular music in such a way that, when we sing the aforementioned chant in church, it subconsciously recalls in our minds the way in which we enjoy said popular music. It teaches congregants that worship music is meant to do the same thing that popular music does: Make them feel good, and get them pumped up. This is of course not to say that there is no value in getting excited during worship; there can be a lot of value in achieving real and abiding joy in the context of liturgical music. However, the more I dwell on this topic, the more I believe that the experiential aspect of liturgical music isn’t its primary purpose. For millennia, liturgical music was meant to invoke holiness, to inspire awe, to remove people from the ordinary and draw them into the extraordinary. Every aspect of the church was meant to reflect that sensibility. Cathedrals and chapels were built with breathtaking complexity and beauty, so that whether a king or peasant walked in, neither could help but have their breath taken away by the sacredness of it. Traditional liturgy is also radically countercultural; instead of encouraging a focus on one’s own experience, it draws people toward the cross, and laying down their lives; stepping out of their individual experience and into the whirlwind of Christ. It even more radically manifests that idea by asking people to eat Jesus’ flesh and drink his blood, thereby in some spiritual (or, depending on your tradition, real) sense fusing our very physical actions with the person of Jesus, losing ourselves, and gaining a new life in him. I think this applies just as readily to liturgy and music in church. God is ready to lead our church communities into spiritual heights, but I think to journey into that world, we’ve got to forgo that which is common and comfortable, and instead embrace that which is challenging; that which draws our gaze away from ourselves and toward the person of Jesus. That’s not easy; it won’t necessarily be palatable to a lot of people in this modern church of ours. But taking up one’s cross and dying daily has never been very palatable either. It seems that the stakes are simply too high to settle for anything less than glory itself, and I can’t get away from the nagging fear that we have indeed become too easily satisfied. Joel, this is just brilliant! You should make this a blog post and I’ll link to it. Thanks for articulating these things so well!